Withs this Self Confidence hypnosis recordings there really is no need to put up with a lack of self confidence. Confidence is about how we view ourselves and often stems from having healthy and positive self regard or self worth. If someone or some situation from the past has undermined your confidence you can decide to quit being a victim to it. Strong self confidence stems from growth and experiencing and through this maturing as a person. Avoidance of fearful situations only serves to undermine confidence. Good self confidence comes through experiencing new and challenging situations. In doing so you often find that your fears were unnecessary. 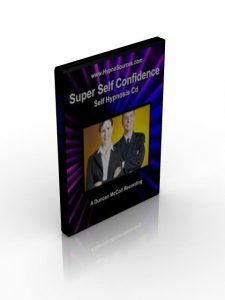 This Super Self Confidence hypnosis cd can help you get back on track to enjoying healthy self confidence, believing in yourself and through this living your life to its full potential.